Three little bunnies do NOT want to go to bed, and they use every excuse they can think of to stay up just a little longer. Most parents can relate when their child stalls for bedtime. Mama Bunny’s three little ones do not want to go to bed, but after good-night hugs, good-night kisses, good-night tickles, and a lot of jumping around, they finally do to the relief of Mama Bunny! A lively call-and-response text makes this book an especially good fit for storytime and bedtime. Large type, loads of rhythm and repetition, and Carin Berger’s beautiful cut-paper illustrations add to the excitement and make this a true celebration of the love between parent and child. 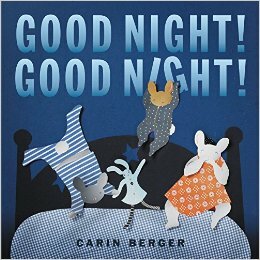 A playful and interactive picture book, featuring a call-and-response text and stunning collage artwork by award-winning author-artist Carin Berger. It’s a must read for parents of little once who like to stall at bedtime!